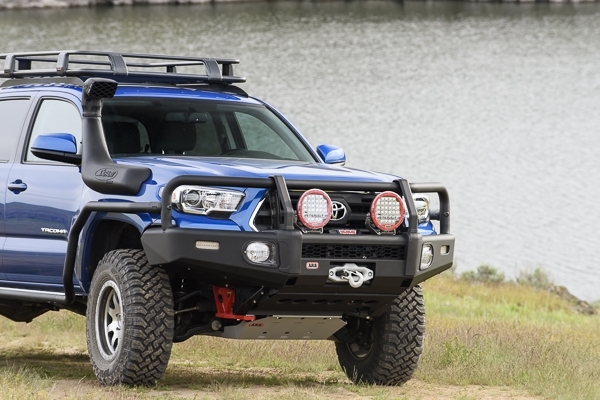 Toyota’s recently released Tacoma is the first US-specific vehicle to receive the new ARB Summit Bar. The all new Summit bar continues the ARB tradition of pioneering innovation and relentless pursuit on quality. Summit is a modern interpretation of the iconic ARB Deluxe bar, styled to complement modern 4x4 vehicles through a fresh, contemporary design. Building upon our proven air bag compatible bull bar mounting structure, the Summit bar incorporates unique design features such as a 30mm edge radius on the wings and center pan, wider press formed cover straps, 60.3mm top frame tubing, two piece polyethylene buffers and redesigned fog lights. This results in the most visually impressive frontal protection system on the market. Chassis mounts have been utilized to ensure that the Summit bar is securely mounted to the chassis and the crush rate characteristics of the air bag system are retained. The bar mounts have had extensive Finite Element Analysis (FEA) testing and destructive crush testing to ensure that they do not deviate from the manufacturers chassis impact performance standards. Vehicle specific design for the 2016+ Toyota Tacoma. Provision to accommodate ARB Intensity LED’s and a range of IPF lights. ARB fog light (part no 3500590) is included. Bar adds approximately 8 inches to the overall length of the vehicle. Finished in satin black powder coat, which is paintable for color matching the vehicle.